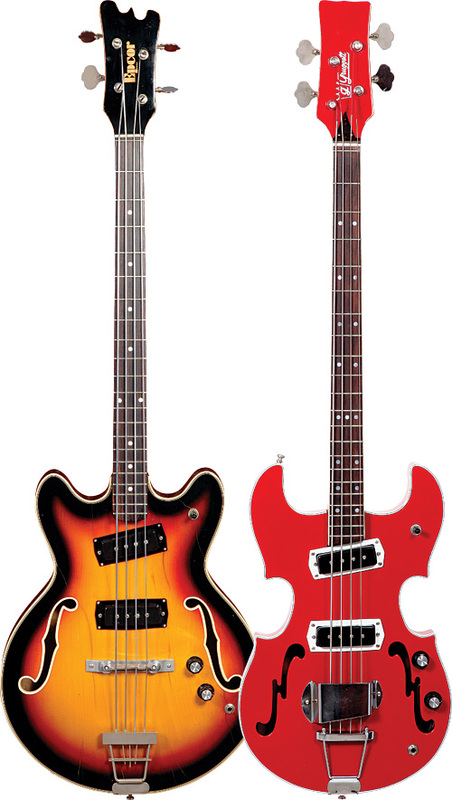 (LEFT) Epcor bass. (RIGHT) Gruggett Stradette. Photos: Michael Stewart. Instruments courtesy of Bob Shade. 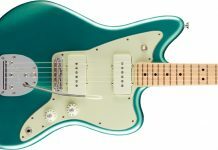 The history of guitar manufacturing in the Bakersfield area of California includes names like Mosrite, Hallmark, and Standel. One of the most unusual (and rare) was the Gruggett Stradette. 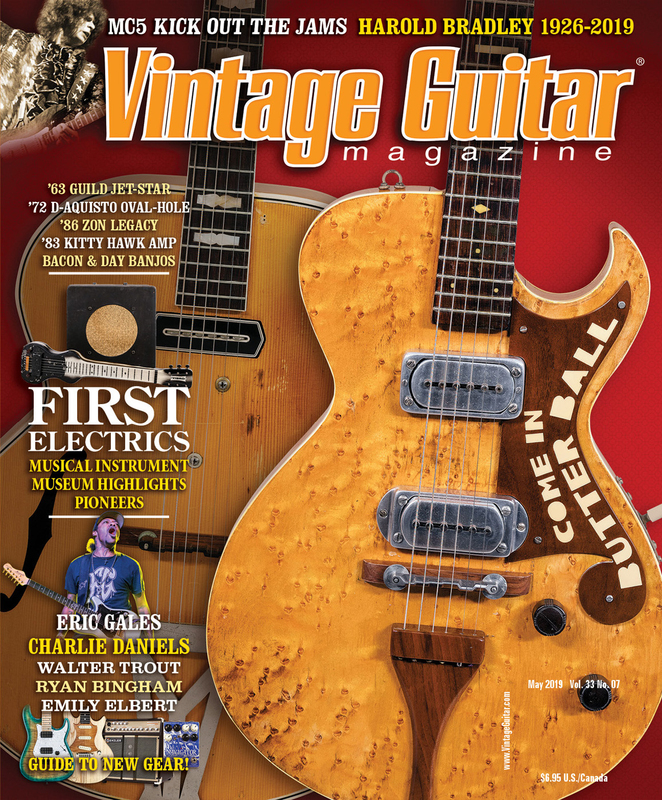 Guitar builder and company founder Bill Gruggett had affiliations with Mosrite and Hallmark before setting out on his own in 1967. He designed the Stradette to look like nothing else, and though he set out to make basses only (he was a bassist), the line ultimately consisted of one- and two-pickup basses, a six-string guitar, a 12-string guitar, and a doubleneck. 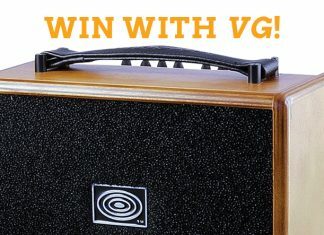 Stradette bodies, described in company literature as “semi-acoustic,” measured 121/4″ wide and 31/2″ deep, were made from alder with a laminated arched top and back, and had three-ply binding front and rear. Necks were maple, with a bound rosewood fretboard and dot markers. 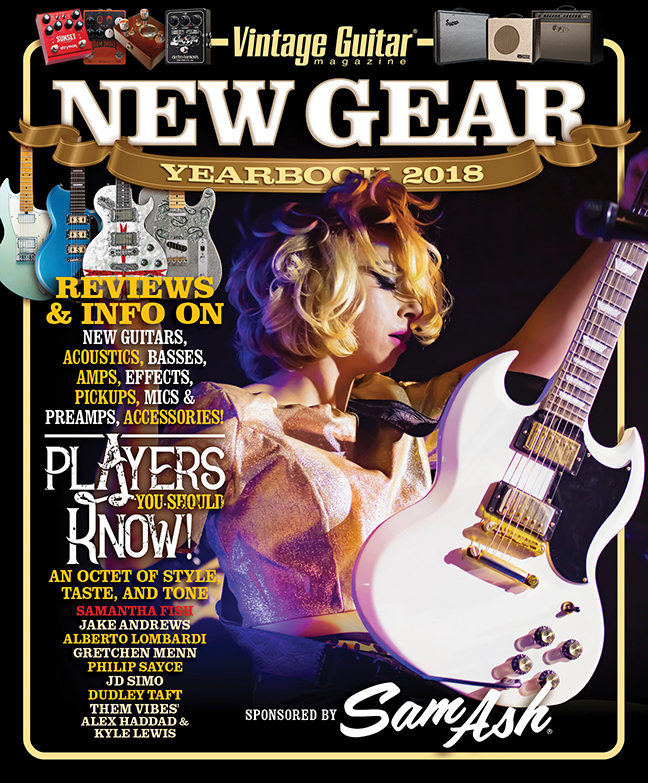 Scale length on the bass was 301/2″, tuning keys were Klusons, and some of the hardware, such as strap buttons and the handrest, was the same used on instruments produced by other companies in the neighborhood. 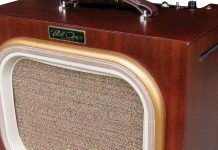 The Hi-Fi pickups were hand-wound and covered with a tortoiseshell-colored plastic. The neck pickup was mounted at a trendy angle favored by local builders. Advertised finishes were Goldenburst and Cherryburst, but this rare Cardinal Red example may have been dressed up for the 1967 NAMM show in Chicago. 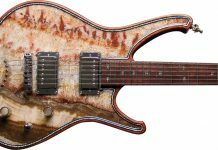 As for its odd shape, Gruggett says he was trying to combine a classic violin with a modern double-cutaway guitar. The hybrid look is arguably the line’s most endearing feature. The Stradette never really got off the ground, and in ’68, Gruggett closed his company’s doors. 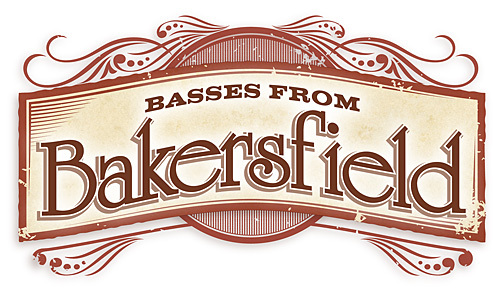 Only a few basses were made. The one featured here spent decades in the possession of a restaurateur in Bakersfield who passed it on to his son, who in turn sold it to the present owner. 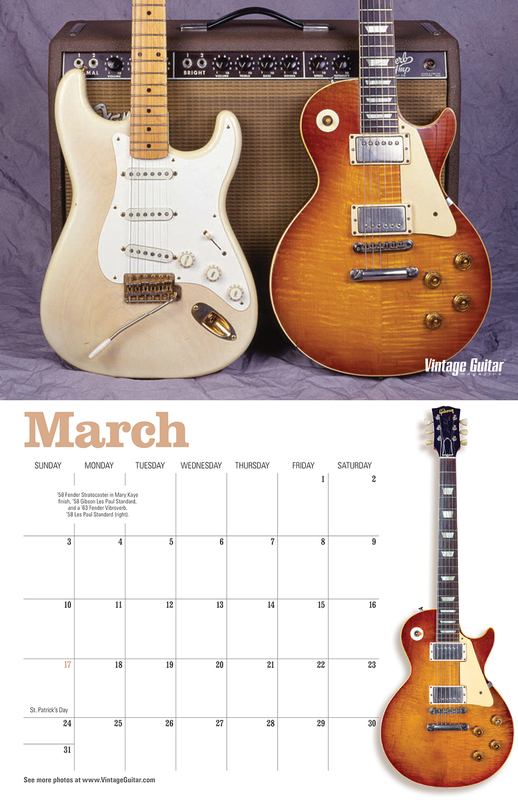 Today, Bill Gruggett is a builder and consultant to the present-day Hallmark, which offers (among other models) retro versions of Stradette guitars. An even-more-shortlived (and rarer) brand from Bakersfield was Epcor, a line built by Hallmark when the company was run by Joe Hall. 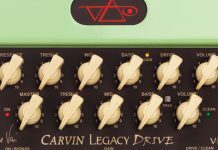 It was conceived by Ed Preager, a manufacturer’s rep who lived in Beverly Hills, drove a Cadillac, sported a Rolex, and wanted to sell a guitar that would not conflict with any of the lines that made him successful. 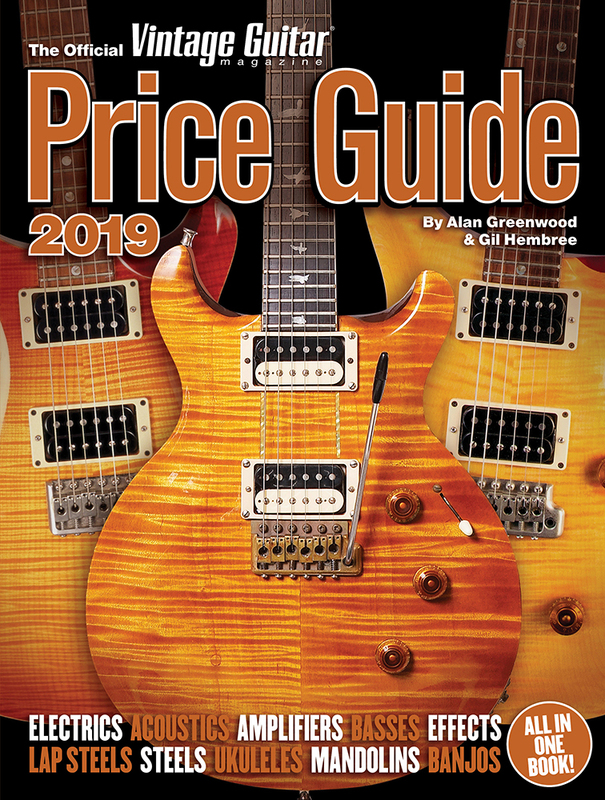 Preager approached Hall in September of ’67, wanting to create a budget-priced hollowbody, which was something of a contradiction since hollowbody guitars and basses are inherently more expensive to produce than solidbodies. Nevertheless, Hall and Preager agreed to create the Epcor line (the name being a combination of Preager’s initials with the first three letters of “corporation”) and set a goal of producing 200 instruments per month – six-string guitars, 12-strings, and basses. 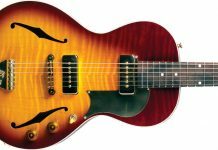 They used laminated bodies made in Italy with either red or three-tone sunburst finish, five-ply binding on top, three-ply on the rear edge, and single-ply on their f-shaped sound holes. Necks and pickups were made by Hallmark. 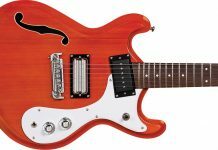 The Epcor headstock silhouette alluded to the letter E… a concept essentially plagiarized from the M-topped headstock of nearby Mosrite. The bolt-on maple neck was two-piece, with an unbound Brazilian or Indian rosewood fretboard. Its scale was 301/2″. Hardware and other parts included bridges made by Bigsby, Kluson tuners and tailpieces, and Hallmark strap buttons and knobs. Pickups were Hallmark’s own design. An estimated 30 Epcor instruments were made before the deal fell apart for financial reasons, though Hall reportedly assembled a few more, perhaps using other brand names, from leftover parts. These are just two more examples of American instruments that started with a solid concept and good marketing, but didn’t last long. One wonders how many others would fit the category.